Description: dir. F. Javier Gutirrez, 2008, Spain, 93 min. What would happen if we found out that a meteorite would destroy the Earth and humankind in a matter of 72 hours? The inhabitants of a small, remote town are terrified by this news as chaos, panic, and desperation spread across the world. A family with four children must withstand yet another threat, the revenge of a convicted criminal who has escaped from prison amid the confusion. The children’s uncle (Victor Clavijo), who had hope to spend three days away from the hysteria listening to his favorite music, is now obligated to protect them. 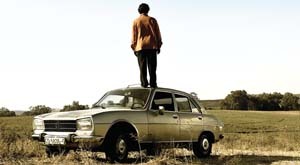 This brilliant apocolyptic fantasy, winner of the 2008 Malaga Film Festival, is both an intelligent thriller and visually fascinating, an unusual Western and a social drama with a heart-racing pace. This film won the audience award at the 2008 Berlin Film Festival, and was selected for the European Film Academy Awards. Que hariamos si supieramos que un meteorito se estrellara contra la tierra en 72 horas acabando con la humanidad? Los habitantes de un pueblito remoto escuchan la noticia aterrorizados mientras el caos, el panico y la desesperacion recorren el planeta. Una familia con cuatro ninos debe ademas soportar otra amenaza, la de una antigua venganza de un criminal convicto que ha escapado en la confusion. El tio de los ninos quien alejado de la histeria pensaba pasar los tres dias escuchando su musica favorita, se ve ahora obligado a protegerlos. Esta brillante fantasia apocaliptica, ganadora del maximo galardon del Festival de Malaga 08, es en partes iguales un thriller inteligente, visualmente fascinante, un Western inusual y un drama social con un ritmo trepidante. El film aclamado por el publico del Festival de Berlin 08, fue seleccionado para los Premios de la Academia Europea de Cine.